Sunday marks the 13th time a Raiders game will be broadcast in Navajo on KTNN 660 AMFor the seventh consecutive season, KTNN 660, the Voice of the Navajo Nation, will broadcast a Raiders game to their audience in the four-corners of the Southwest this Sunday when the Oakland Raiders take on the Detroit Lions at O.Co Coliseum. 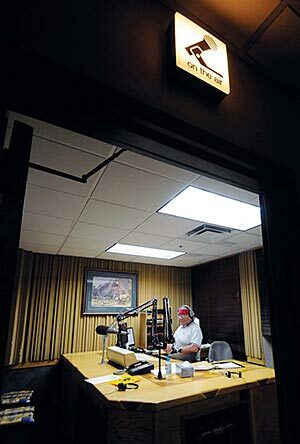 Raider games have been broadcast in Navajo 12 previous times over the past six seasons through an agreement with KTNN 660 AM–one each in 2010 and 2009, two in 2008, four in 2007, two in 2006 and two in 2005. L.A. Williams and Ray Tsosie, both award-winning broadcasters, will again call the action. "We salute the Navajo Nation and are honored and proud to broadcast Raiders games in Navajo," said Oakland Raiders Chief Executive Amy Trask. "Broadcasting our games in Navajo is part of our commitment to reaching our global fan base in a variety of languages and furthers the efforts of the Navajo Nation to preserve this important and valuable language." By Karen ShadeA retired welder from General Motors’ Oklahoma City plant, Randall formed the idea to reprint the Bible in the language of the Muscogee-Creek and Seminole people when he attended a Muscogee language class. Randall doesn’t speak the language but for some phrases and a handful of words, yet he remembers his parents and grandparents speaking it in the home to all the children. “They spoke fluent Creek and talked to one another. They spoke to us in the Creek language also,” he said. “We understood what they were saying, but for some reason we didn’t pick it up.”And:Randall learned a few early versions of the Creek Bible New Testament had been printed. However, it was a woman named Ann Eliza Worchester Robertson who made the biggest leap. By the time of her death in 1905, Mrs. Robertson, a missionary at the old Tullahassee Mission, had nearly finished revising her translation of the New Testament for its fifth edition printing. She’d even worked on part of the Old Testament directly from Greek holy texts where she could. A woman of letters, she found antiquity Greek language had similarities to Creek, and it made sense to work from a more direct source than from the King James Version. Eventually, the Tullahassee Mission was closed. Robertson was a frail woman and tended to be ill. During her periods of recuperation, she worked on her translation with the help of native speakers. When Randall resumed her work in 2002, he began by retyping the translation with the help of his son, Monte Randall, to put it back in print. He streamlined the style by making changes such as converting all–not just some–of the chapters to Arabic numerals rather than Roman numerals. He was careful about approaching his work and any necessary revisions. Comment: For more on the subject, see Comic Books Featuring Indians. By Kyle HopkinsFrozen Whitefish is a Bethel based Alaskan Native Yupik Rock band formed in 2010 and all lyrics are written in the Yupik Eskimo language. Frontman Mike McIntyre was raised in the small village of Eek and spoke Yupik as his first language before moving to Bethel as a young child. Frozen Whitefish was first a project started by Mike after he returned from a trip to Greenland where he played drums for the Kuskokwim Fiddle Band in the Inuit Circumpolar Conference in 2010. He was inspired by the influence of their Native language in their own music and wanted to do the same here in Alaska. Soon after he started recording his music in his home studio, he got a request from a Native radio station in Washington to send his songs over to a TV producer with the Discovery Channel, which was gathering Native music for the "Flying Wild Alaska" TV show. Native American Version of Berenstain Bears Launches SoonAfter more than a year in the making, the Lakota version of the popular cartoon The Berenstain Bears or Matȟó Waúŋšila Thiwáhe—The Compassionate Bear Family—will make its debut September 11 at 9 a.m. through South Dakota Public Broadcasting (SDPB) and Prairie Public Television. Two episodes a week will air on SDPB digital channel 3 and Prairie Public’s digital channel 4 every Sunday morning through November. Then, local access stations KOLC and REZ IPTV will broadcast the show to viewers on the Pine Ridge and Cheyenne River reservations.Comment: For more on the subject, see Berenstain Bears Cartoons in Lakota. By Ranae BangerterAll grades at Eagle View Elementary School will have a chance to take Ute Indian Tribe language class as a specialty course. During a presentation to the Uintah School Board on Aug. 9, Eagle View Principal Robert Stearmer explained when the course would be taught and how students could join it. He said the 30-45 minute class will be taught three to five days a week depending on the schedule associated with similar specialty classes and can substitute the time slot normally used for music, P.E. or art class. La. 's Tunica tribe revives its lost languageThere were a few old, wax phonograph cylinders with the language recorded on them, but years of wear and background noise made the chants impossible to decipher, said Kathleen Bell, a graduate student who worked on the project. "The quality was terrible, and the drums more or less drowned out the chants," she said. The researchers were able to refer to past work by academics. One published a short grammar of the language in 1921, and a linguistics scholar in 1939 worked with the last tribal member known to be conversant in the Tunica language. Mary Haas, a linguist who worked with a number of Native American languages, worked with a tribal elder, writing down stories and bits of Tunica history. She used the International Phonetic Alphabet, marking stress and some intonations, but not enough to give Maxwell's group the rhythm, timing and the way the language was phrased, Bell said. By Will ChavezIt’s as it should be in the Cherokee Heritage Center’s Ancient Village because the Cherokee language is being spoken and heard daily. Village tour guides J.D. Ross and Steven Daugherty, both fluent Cherokee speakers, use the language to explain the culture and traditions showcased in the village while using their first language. This is the second year the men are serving as Cherokee-speaking tour guides. Ross, of the Greasy Community in Adair County, said he enjoys speaking Cherokee and teaching others the language but finds it unfortunate that not many Cherokee-speaking people visit the village.Below: "Cherokee Heritage Center tour guide Steven Daugherty demonstrates bow shooting with a Cherokee bow for visitors at the Ancient Village in Park Hill, Okla. He is one of two Cherokee-speaking guides for the Ancient Village." By Jonathan GrassTlingit speakers and educators are fighting to keep that language alive. As those at Sealaska Heritage Institute (SHI) put it, creating new speakers will be key in accomplishing this. In fact, the Native institute has just introduced a new Tlingit language card program as part of this mission. The program is a set of flash cards and audio CDs to help gain efficiency in the alphabet. They use pictures as well as an online interactive tool to help kids learn the Native language. Tlingit Curriculum Specialist Linda Belarde said the tool is important because new speakers are needed for a language to survive. As for Tlingit, she said there just aren't that many birth speakers left.Comment: For more on the subject, see Children's Book in Tlingit and Learners' Dictionaries for Alaska Languages. By Margaret RockSamuel Herrera, who runs the linguistics laboratory at the Institute of Anthropological Research in Mexico City, found young people in southern Chile producing hip-hop videos and posting them on YouTube using Huilliche, a language on the brink of extinction. Herrera also discovered teens in the Philippines and Mexico who think it's "cool" to send text messages in regional endangered languages like Kapampangan and Huave. Almost as soon as text messaging exploded on the world stage as a means to reach anyone, anywhere, and anytime, young people began to find a way to scale it back, make it more exclusive and develop their own code or doublespeak to use on the widely-used devices. Shorthand and abbreviations became a popular way to keep the "inside joke" of LOL, or "laughing out loud," and brb, or "be right back," within the circle. In time, though, these catchphrases reached a broader audience, losing their cache and exclusivity. As soon as its use became widespread and commercial, the code was no longer "cool. "Comment: For more on the subject, see Cherokee on the iPhone. By Darla SlipkLast summer, Hopper attended an intensive, weeklong program called Oklahoma Breath of Life—Silent no More. The workshop, hosted at the University of Oklahoma’s Sam Noble Oklahoma Museum of Natural History, was designed to give participants the tools they need to help revitalize American Indian languages that are endangered. The Breath of Life project is a joint effort by experts from the University of Texas at Arlington and the University of Oklahoma in which linguists mentor American Indians so they can better recover endangered languages. By Diane SmithFields is a participant in the Breath of Life project—a joint effort by experts from the University of Texas at Arlington and the University of Oklahoma—in which linguists mentor American Indians so they can better recover endangered languages. "We are growing field linguists," said Colleen Fitzgerald, associate professor and chairwoman of UT Arlington's Linguistics Department. "We are transferring knowledge to community members so they can teach their own languages. "And:Besides training American Indian community members to be linguists on the ground, UT Arlington will be working to create linguistic databases that will ultimately enable the creation of online dictionaries and collections of texts in various languages, Fitzgerald said. By Alison FloodThe first ever children's book to be translated into the endangered Alaskan language of Tlingit has just been published, with hopes riding high that it will help keep the dying language alive. Inspired by the classic story of the town mouse and the country mouse, American book award-winning author and historian of her mother's Tlingit tribe Ernestine Hayes wrote The Story of the Town Bear and the Forest Bear in English. Local publisher Hazy Island Books then worked with Tlingit elders to translate the book into the highly endangered language, spoken today by only around 500 people, releasing Aanka Xóodzi ka Aasgutu Xóodzi Shkalneegi–illustrated by Tlingit woman Wanda Culp–earlier this month. "As far as we know, this book is the first to be originally written in English and then translated into the Tlingit language," said Hayes, an English professor at the University of Alaska. By Maria ScandaleInfluences of the modern world linger outside, but for two hours twice a week, mothers and girls are sitting with elder women in the Meskwaki Senior Center sewing traditional clothing and learning the Meskwaki language. The Meskwaki Sewing Project has been recognized by the Iowa Arts Council and the National Endowment for the Humanities as worthy of supporting with a mini-grant. By Mychaylo PrystupaWhile most academics publish research papers, geography professor Ian Mauro has taken a different tack--making documentary films. 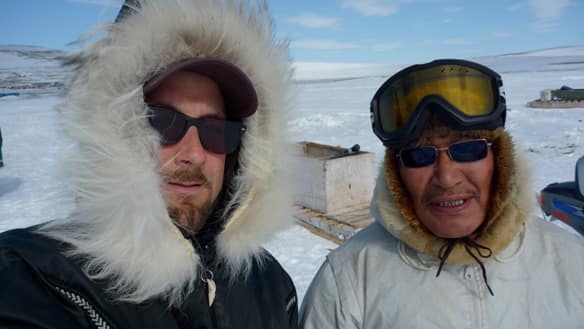 Mauro's latest research project, titled Qapirangajuq--Inuit Knowledge and Climate Change is the world's first documentary on climate change as told by Inuit in their language. Mauro is pioneering what he calls "video research"--using filmmaking techniques to find and publish scientific discoveries. By Matt KettmannFormer Santa Barbara resident and Emmy Award winner Anne Makepeace returns to SBIFF with her latest documentary, We Still Live Here (Âs Nutayuneân), which is a perfect-for-PBS look at the Wampanoag people’s quest to revive their ancestors’ language. These New Englanders find help and inspiration in the oddest of places, and the viewer comes to quickly realize that the value of dead languages just might be infinite. She recently answered some questions via email. How did you find out about this revival? I grew up in New England and, like most Americans, I had never heard of Wampanoag, did not know that they were “the Indians” who helped the Pilgrims to survive, and was completely unaware that any of these Indians still lived on their homelands in Massachusetts. Then, in 2006, I was hired by the American Experience series at WGBH to produce the first of a five-part series about Native Americans called “We Shall Remain.” My part was about the Wampanoag and the first English settlers in New England: the Pilgrims (and later Puritans) in 17th Century Massachusetts. It was while working on this project that I got to know Jessie Little Doe Baird, her family, and other members of the Wampanoag Nation. Learning about their history was a complete revelation to me, and I was amazed by Jessie’s story and the work the community was doing to bring back their language. When things fell apart with WGBH, I decided that the film I really wanted to make was the unprecedented story of the resurrection of the Wampanoag language. What drew you personally to the material? I have always been interested in Native Americans, and some of my films, notably Ishi the Last Yahi and Coming to Light, are on Native American subjects. Jessie’s story of resurrection, especially after learning about their devastating and largely unknown history, drew me so powerfully, partly I think because of my own background—I am descended from those Puritan settlers who co-opted Wampanaog lands or worse—and partly because of the intensely passionate dedication and commitment that Jessie and others have for bringing their language home.Comment: For more on the subject, see Native Documentaries and News. By Craig HenryNo, this isn’t some run-of-the-mill basketball game. This game involves one of the Cherokee Language Immersion Program’s basketball teams. And just like the rest of the LIP, basketball is taught exclusively using the Cherokee language. The boys and girls teams are comprised of 19 students in third, fourth and fifth grades. Though the basketball program was formed in 2009, the 2010-11 season is the first the teams competed with area schools. Walking and Talking with NanabushThe Ojibwe Cultural Foundation invites you to walk and talk with Nanabush. Nish Tales: Walking and Talking with Nanabush is a language learning and story sharing site for kids and adults wishing to learn Ojibwe. Nanabush’s humorous escapades and great adventures have entertained generations of Anishnaabe and helped preserve our language. Nish Tales: Walking and Talking with Nanabush is a web site created to do the same. Here we use the humourous adventures of Nanabush to help people learn some basic Ojibwe. There are two Nanabush stories now on the site: The Power of the Skunk and Nanabush Loses the Meat. The stories are presented as animated clips, text and audio files . All media is in a bilingual format for reading, listening and watching. More entertaining stories of Nanabush and more language learning content will be added in the coming months. Nanabush is the main character in many Ojibwe legends and is as old as the Ojibwe language itself. He was sent to teach the Anishinaabeg how to live. His mother was Anishinaabe-kwe and his father a spirit. Being half spirit he had amazing abilities. But being half human, he had the virtues and flaws that people have and often could not control his humanly wants and needs. Nanabush could be selfish or generous; cowardly or brave; caring or spiteful; always curious and mischievous and often his own worst enemy. Sometimes he daringly saved the Anishinaabek, other times he caused them everlasting hardship. Nanabush walked all over Turtle Island. His many humorous escapades and great adventures explained the natural world, entertained generations of Anishnaabe and helped preserve the Ojibwe language. He remains an important figure in Anishnaabe culture. Nish Tales: Walking and Talking with Nanabush looks at the humourous and fun side of some of his adventures.Comment: The videos use limited, cartoon-style animation. The watercolor backgrounds are nice, as are the sound effects and music. The tales are cute and short enough to hold one's attention. All in all, I'd say these videos are an effective teaching tool. By Vincent SchillingRoss talked about the technological offerings by the tribe to help tribal members learn Mohawk, specifically, the Can 8 online learning system, the Nintendo DSi and Rosetta Stone Mohawk language software. By Alysa LandryHighly publicized and expensive efforts to preserve and revitalize the Navajo language are widespread on the sprawling, 27,000-square-mile reservation, yet one of the most ubiquitous modes of preservation also is one of cheapest. Anyone with a battery-powered radio can listen to any of a handful of Navajo language stations that cover the reservation with sound waves. Shared Vision member Michael Meuers is “absolutely psyched” about what was unveiled Monday. By Anne WilliamsShared Vision member Michael Meuers is “absolutely psyched” about what was unveiled Monday. Ojibwe translations for nearly 100 English phrases common to Northern Minnesota are now available online and on campus at Bemidji State University and Northwest Technical College. The multimedia materials, which include paper form and audio clips, are part of a collaborative effort between Shared Vision and BSU. Shared Vision is an organization dedicated to improving relations between American Indians and non-Indians in the community. Help preserve the Eyak language by visiting new websiteThe Eyak Language Project's "Word of the Week" went live online Jan. 1 as part of an effort to preserve the indigenous Southcentral Alaska language whose last native speaker, Cordova-born Chief Marie Smith Jones, died in 2008. The Word of the Week gives everyone a chance to participate, says the homepage for the project, directed by Anchorage filmmaker Laura Bliss Spaan. "Whether you learn a few words that mean something to you or endeavor to become fluent, your efforts will mean that this irreplaceable way of speaking and thinking about the world will never be lost." The first featured word is "iishuh," the Eyak equivalent of "hello."